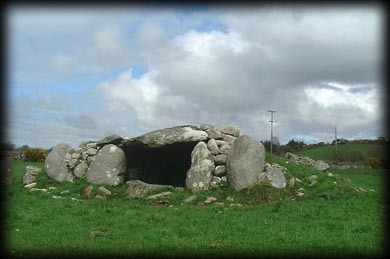 In the townland of Carrowcrom about three kilometres north east of Corrower ogham stone is this almost perfectly intact wedge tomb. The tomb has a facade with four large orthostats and dry walling in between them at the front. Most of the cairn as you can see from the images is still intact and clearly visible. Although this tomb is quite small it is still really impressive and an excellent example of a wedge tomb. The only downfall is the close proximity of the National Monument sign. 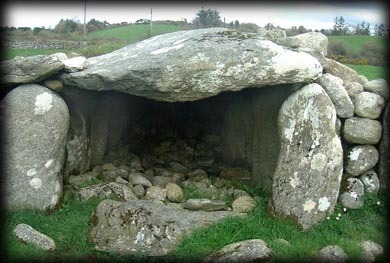 Access to this tomb is extremely easy and if you are around the Bunnyconnellan area of Mayo then I recommend you visit this gorgeous little wedge tomb and also the Corrower ogham stone three kilometres to the south west. Situated: About seven kilometres South East of Ballina. 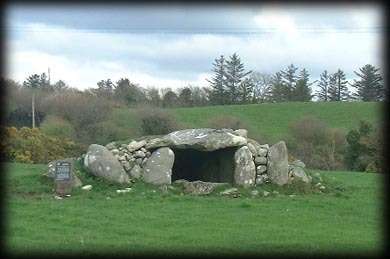 From Ballina take the R294 East, then take the third right after the golf course, then after about 3 kilometres take a left at the crossroads then turn right at the second right, the megalithic tomb is in the field immediately to your left. Discovery Map 24: G 3143 1616. Last visit April 2004.